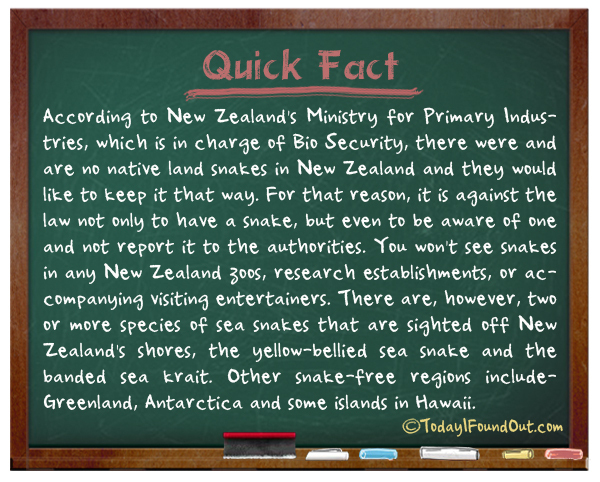 According to New Zealand’s Ministry for Primary Industries, which is in charge of Bio Security, there were and are no native land snakes in New Zealand and they would like to keep it that way. For that reason, it is against the law not only to have a snake, but even to be aware of one and not report it to the authorities. You won’t see snakes in any New Zealand zoos, research establishments, or accompanying visiting entertainers. There are, however, two or more species of sea snakes that are sighted off New Zealand’s shores, the yellow-bellied sea snake and the banded sea krait. Other snake-free regions include- Greenland, Antarctica and some islands in Hawaii.